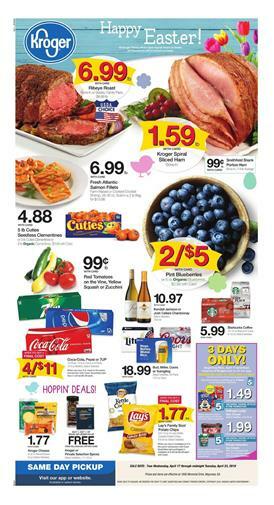 Find great coupons, special sales like mix and match, Hass Avocados, fresh meat, and Easter sale on the latest Kroger Ad. The preview is available for browsing right now. Shop with the 4 days only BOGOs and discounts. Stouffer's party size or large family size entrée will cost only $8.99! Stock up the refreshing soda packs before the hot climate takes over the control. It's only a favorable thing to have some tasty and cold soft drinks around. 3x fuel points deal still goes at Kroger stores. Earn 3x points with your purchase of fresh ground beef which is only $1.99/lb! You can save $6 with 3 purchases from the mix and match sale of household products. Tide liquid laundry detergent costs only $9.99. Spend $20 on the participating items to save $5 on packaged foods. Stock up some quick meals in case you want to suppress your hunger or just replace your main course for a practical solution. P.F. Chang's meals will cost $6.99 with this discount. Multiple-buy discounts are interesting offers as well. Many products are featured in this particular list of deals. Buy 4 Coca-Cola, Pepsi or 7UP 6-packs paying only $10 at Kroger. Kroger's Easter sale is also a promotion in the content of the latest Ad. Toys, treats, and snacks are available in this range. Holiday Home Easter Plush will be 20% cheaper. Buy candies for Easter and pay lower. Buy 2 Get 1 Free deal will be valid on Reese's Peanut butter or Cadbury creme eggs! 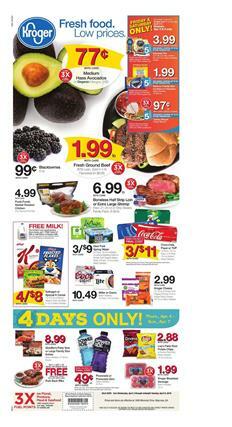 Kroger Ad is again full of great deals. Today, you can browse deals like 3x fuel points, mix and match sale, 4-days only discounts, and more. There is also a weekend sale that covers Minute Maid orange juice and Wright bacon. Use the coupons up to 5 times. Buy soda packs or top brands of the beverages at Kroger. Coca-Cola, Pepsi or 7UP 12-pack items will cost 3/$11! Earn 3x fuel points for some purchases like Russet potatoes. The potatoes will cost only $2.49 for 10lb. bag. Shop with the deals of the mix and match sale participating products list. You'll be able to purchase some favorite snacks and grocery items at a lower price. For example, Nabisco Ritz Crackers are only $1.89 with the mix and match sale discount. It's in fact Buy 5, Save $5 deal! Among the participating items, Kraft barbecue sauce is available and its price is only $.49. These prices are valid starting on Wednesday. Get healthy snacks while earning fuel points. 3x fuel point is possible with the purchase of Simple Truth Pistachio kernels which is only $4.99 at Kroger stores. Have a look at the pet foods and 200 bonus fuel points. Spend $30 on Blue Buffalo Wilderness dog or cat food to earn that bonus fuel points. Also, check out the final page for Easter sale. One of the best toys is Holiday Home Easter plush that is 20% cheaper this week. Find more 20% discounts on Easter products on that page. You can follow the Facebook page, subscribe to this category, get emails about the posts. Allow your browser to get notifications and know what's hot in future days of shopping.